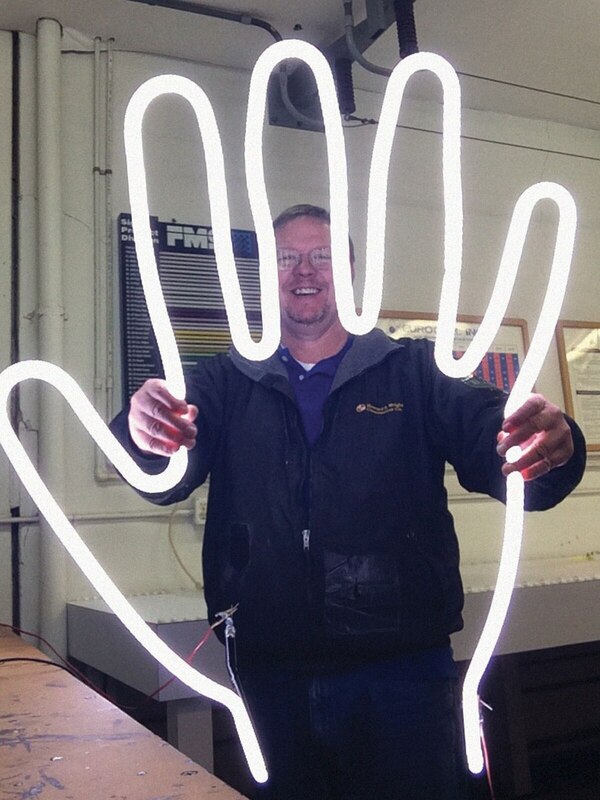 Mike Heist is Portland's Best Neon Repairman. In a corner of his cavernous workshop in North Portland, Mike Heist gazes adoringly at a disassembled neon Firestone sign from 1969. "You see how it looks like it was blocked out right there? That's actually block-out glass," he says. "They don't even make that no more. It lasts a long time if it's done right, the weather don't get to it or somebody don't break it." Heist has been working in neon since the mid-'80s, when he and his brother went into business together shortly after Heist got out of the Navy. In that time, he's forged many of Portland's most iconic signage—the "Go By Tram" sign below the Portland Aerial Tram, the Hollywood Theatre's lower marquee, the beautiful blue Volvo sign on West Burnside and 21st Avenue. But much of his work these days is fixing up the past. While he's still called upon to create new works—right now, he's finishing work on a gigantic, stunning red sign for McMenamins Kalama Harbor Lodge—Heist is regarded by many as Portland's go-to neon repairman. That's almost by default—there's not many left who can do it. Back when he started, Heist reckons there were a dozen neon bending and repair shops in the Portland area. Now, he's one among a small handful of local neon workers, and the only one with a dedicated industrial workshop. After the death of his brother in 2012 and the departure of an employee with brain cancer, Heist was alone in his building. Being something of a local historian, Heist waxes romantic about the 1950s, the glory days of neon, when all of Broadway seemed to have a fluorescent glow. He vividly recalls when neon workers created huge grids and spirals of neon to light up the electrical towers at Bonneville Dam for airplane pilots. "Put it up on his back, climb up there, take the old one off, put the new one in," he says. He mimes firing an imaginary rifle. "'Cause what people do is, they sit up there on the mountain and…chickoo." Those days are fading out—the "old school, old purpose" neon light Heist has devoted himself to is being replaced with LED. But he doesn't grumble. His love of neon comes with a deep faith in its longevity—many of the decades-old signs he repairs are being serviced for the first time. Peering down at a dusty old Hamm's sign, Heist notes that the tubes have thin and inconsistent bends. "Yeah, that's the sign of a beginner. But, I mean, you see stuff like this that you think is a hack job, but it lasts for years," he says. "So how much of a hack job is it?" BEN STONE.